Advantage Book Binding can accommodate a variety of folding needs, from signatures for binding to double gate brochures and from French folded dust jackets to map folds. Make your product look professional with different kinds of folds. 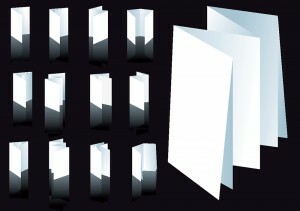 Brochures and mailings are more likely to be eye-catching and interesting to your mailing list if the folds are nice and unique, rather than if you just go with a regular, every day fold. Advantage Book Binding can help your brochure or mailing stand out in the sea of mail that most people receive every day. Dust jackets have many advantages to them, but each most be folded uniquely to fit the book that it is designed for. Advantage Book Binding can fold dust jackets to perfectly fit your book or book product to make it look professional and protect its contents.